These orange silica gel beads are no longer orange when they have absorbed enough moisture. 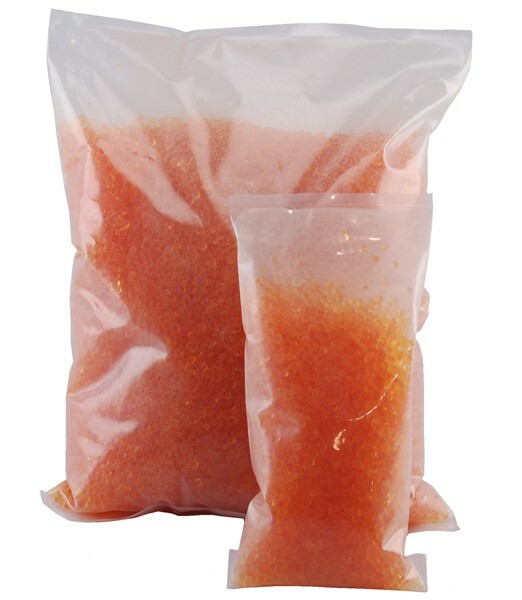 They can be mixed with our bulk silica gel to provide an economical method of using silica gel and still have the benefit of the indicating beads. Available in 1/4 lb. and 2 lb. sizes. Q. Do I need to use the beads as they are or do I mix them with non-indicating silica gel beads? A. You can mix them with the regular non-indicating beads. That is the most economical way to do it. There is no benefit to using 100% indicating beads (save your money and mix these with regular silica gel). A. They are between 2.0 to 5.0 mm in size. A. Yes, they can be placed into an oven at 240 degrees for at least 3 hours to dry them out (they will turn orange again), then put back to use.